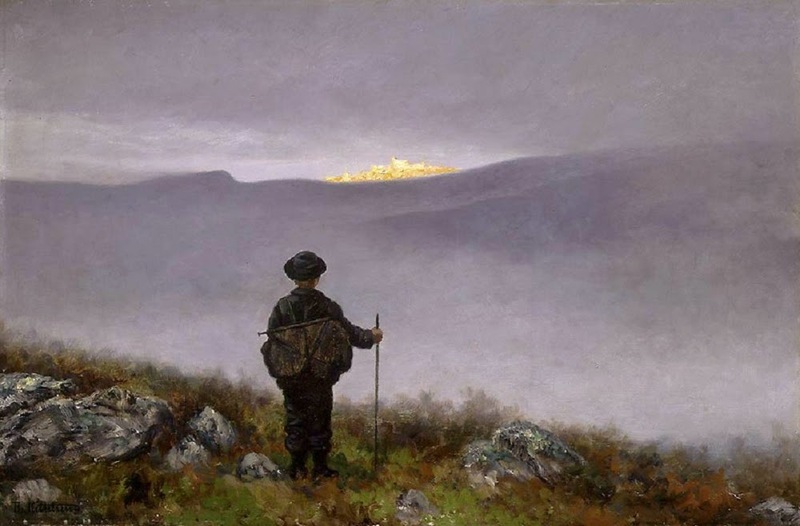 First published on December 21st 1844, Grantræet (Eng. 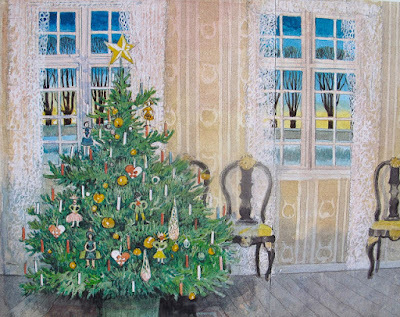 "The Little Fir-Tree") remains one of Danish poet H.C. Andersen's most beautiful, yet dejected fairytales. 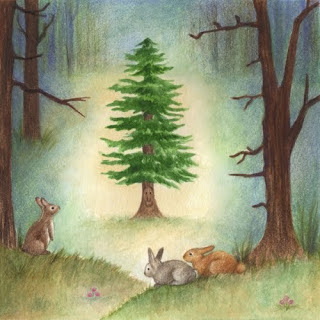 Forming a kind of 'biography' over a fir-tree's lifespan and destiny, the story begins with the first encounter of the tree in the woods. Being one of the smallest pines around, the fir-tree feels undervalued and overlooked. All it longs for is to grow up, eager to get to know the world beyond the forest. The sun rays warns the little fir tree not to have such a hurry, but instead enjoy its youth and savour the moment, the wind and the morning dew. Stabborn and restless as the little tree is, it cannot and will not take the sun's advice. 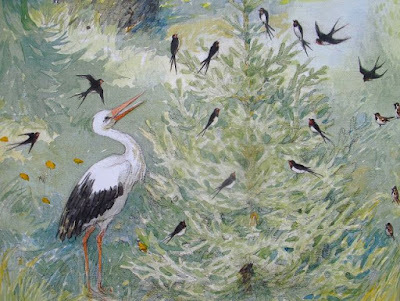 Andersen's overall intention with this fairytale is quite simple; one should live for the moment, not constantly and impatiently look forward, wanting to be somewhere else. With such an attitude to life, one risks overlooking and missing out on the experiences that lie in the present. Most likely, this recognition sprang forth from personal experience as Andersen already as a child had heard and read about the lives and famous deeds of reknowned men, whom he wanted to be like. Therefore, Hans Christian spent his adolescence consistently looking ahead, always wishing to be something else, someone else than who he was. I think most people, unfortunately, can relate to that. To live on the spur of the moment is easier said than done. However, reading this fairytale aknew, I will try nonetheless. To trust that life unfolds in its own pace - that our future and the fundations of our dreams are founded on the basis of today. "Oh, isn't it a nice little tree?" they would say. "It's the baby of the woods." The little tree didn't like their remarks at all. In the autumn, woodcutters came and cut down a few of the largest trees. This happened every year. The young fir was no longer a baby tree, and it trembled to see how those stately great trees crashed to the ground, how their limbs were lopped off, and how lean they looked as the naked trunks were loaded into carts. It could hardly recognize the trees it had known, when the horses pulled them out of the woods. Where were they going? What would become of them? "Do you know where the other trees went? Have you met them?" "That would take too long to tell," said the stork, and off he strode. "Rejoice in your youth," said the sunbeams. "Take pride in your growing strength and in the stir of life within you." "I wonder if I was created for such a glorious future?" The fir tree rejoiced. "Why, that is better than to cross the sea. I'm tormented with longing. Oh, if Christmas would only come! I'm just as tall and grown-up as the trees they chose last year. How I wish I were already in the cart, on my way to the warm room where there's so much splendor and glory. Then-then something even better, something still more important is bound to happen, or why should they deck me so fine? Yes, there must be something still grander! But what? Oh, how I long: I don't know what's the matter with me." The tree did not get over it until all the trees were unloaded in the yard, and it heard a man say, "That's a splendid one. That's the tree for us." Then two servants came in fine livery, and carried the fir tree into a big splendid drawing-room. Portraits were hung all around the walls. On either side of the white porcelain stove stood great Chinese vases, with lions on the lids of them. 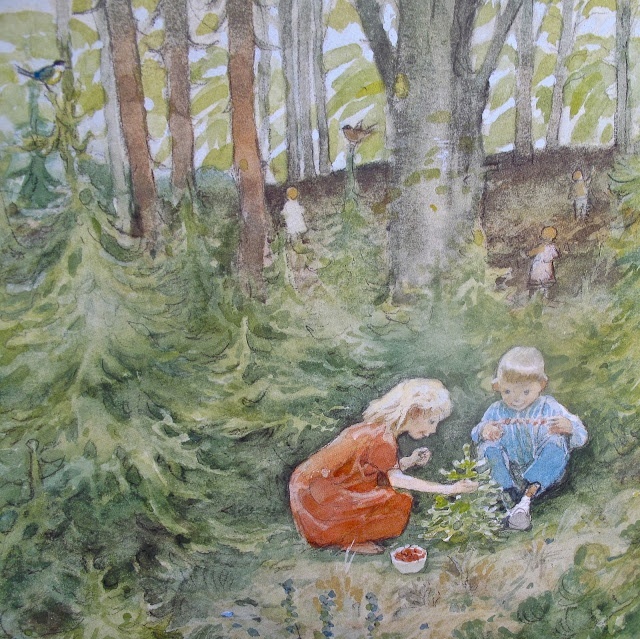 There were easy chairs, silk-covered sofas and long tables strewn with picture books, and with toys that were worth a mint of money, or so the children said.The fir tree was planted in a large tub filled with sand, but no one could see that it was a tub, because it was wrapped in a gay green cloth and set on a many-colored carpet. How the tree quivered! What would come next? The servants and even the young ladies helped it on with its fine decorations. From its branches they hung little nets cut out of colored paper, and each net was filled with candies. Gilded apples and walnuts hung in clusters as if they grew there, and a hundred little white, blue, and even red, candles were fastened to its twigs. Among its green branches swayed dolls that it took to be real living people, for the tree had never seen their like before. And up at its very top was set a large gold tinsel star. It was splendid, I tell you, splendid beyond all words! The children danced about with their splendid playthings. No one looked at the tree now, except an old nurse who peered in among the branches. There they left it in a dark corner where no daylight ever came. "I'm not at all old," said the fir tree. "Many trees are much older than I am. ""Where did you come from?" the mice asked him. "And what do you know?" They were most inquisitive creatures. 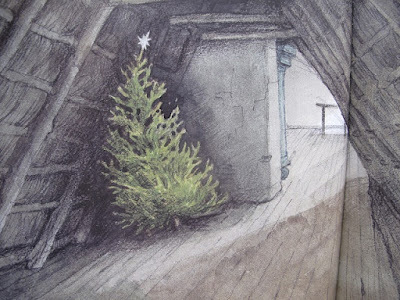 "Look what is still hanging on that ugly old Christmas tree," the child said, and stamped upon the branches until they cracked beneath his shoes.The tree saw the beautiful flowers blooming freshly in the garden. 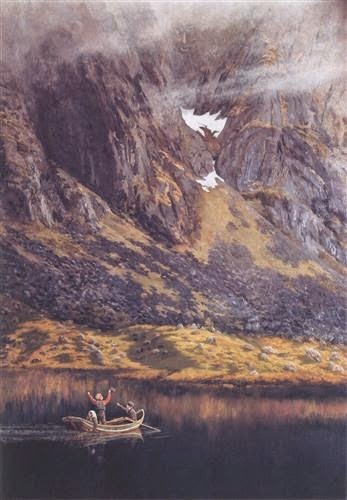 It saw itself, and wished that they had left it in the darkest corner of the garret. 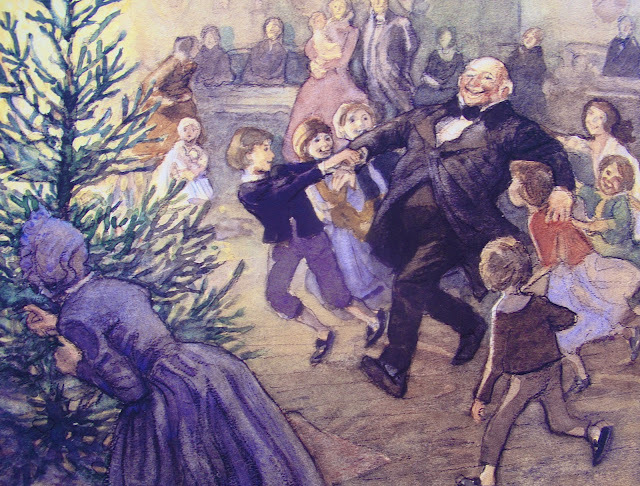 It thought of its own young days in the deep woods, and of the merry Christmas Eve, and of the little mice who had been so pleased when it told them the story of Humpty-Dumpty. The children played on in the courtyard. The youngest child wore on his breast the gold star that had topped the tree on its happiest night of all. But that was no more, and the tree was no more, and there's no more to my story. No more, nothing more. All stories come to an end.